It is well known that the B-52s are the World’s Greatest Party Band. And thirty years and over twenty million albums into their career, there can be no doubt as to why The B-52s remain among the most beloved rock stars ever. 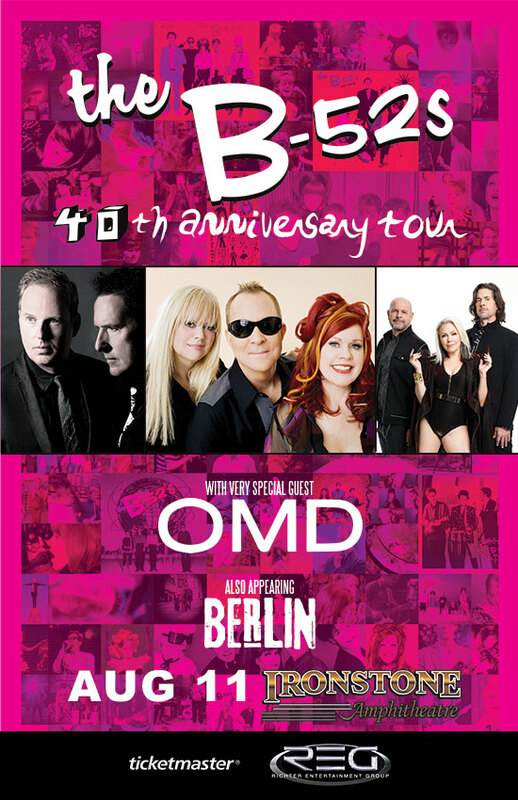 Any mystery concerning the longevity and ongoing appeal of the band is immediately solved when exposed to a unique B-52s concert experience. From the timeless gems of “Rock Lobster,” “Planet Claire” and “Private Idaho” to the more recent classics “Channel Z,” “Love Shack” and “Roam”, the B-52s’ unforgettable dance-rock tunes start a party every time their music begins. Joining this year is Orchestral Manoeuvres In The Dark, which catapulted to fame in the US with the Pretty In Pink soundtrack song “If You Leave” and Los Angeles-based Synth Pop Group Berlin that also brought to the spotlight by the movie Soundtrack “Top Gun” with the song “Take My Breath Away”. Join us in a 80’s pop revolution party on August 11th!